Honea siding on the BNSF Conroe Sub is about 7 miles West of I 45 on FM2854. Site of many meets and crew changes. interlocker with the UP Palestine Sub is Conroe's BNSF Yard. If you come in off IH 45 on HWY 105 after you cross tracks ( UP Palestine Sub.) 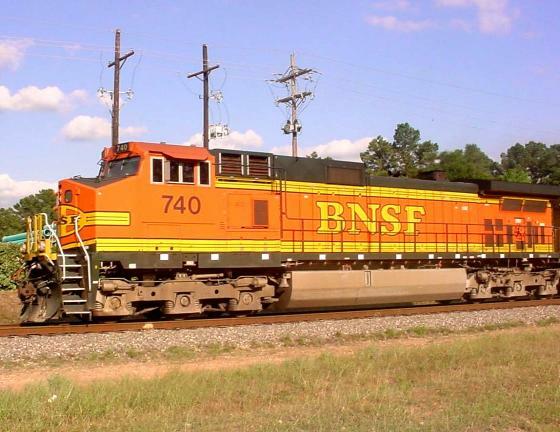 turn right on 2nd St., go 2 blocks and when you come to tracks (BNSF Conroe Sub.) The Yard office is on your right. The yard power is usually on your left. But you never know what might be there. I've seen the famous "Slot Machine" and a ribbonrail train complete with caboose. Waukegan Siding is sometimes where BNSF power for Youens rock trains were parked after dropping cars at Pavers Supply by BNSF crews. Take HWY 105 East from Conroe, Tx towards Cleveland. About 4 miles East of Loop 336 and HWY 105 you turn right on Waukegan Rd at flashing yellow light. Follow to tracks. Check out elephants on North side of Hwy 105 just East of Cut N Shoot post office. Great railfan parking at CPH 195 on Pacific Ave (South Switch of Conroe siding) Just a few feet from tracks. Only couple hundred yards North of interlocker with BNSF Conroe Sub. Picture the Conroe depot in the NW quadrant of interlocker. UP maintains MOW depot in shipping containers there now. In SW quadrant at feed store location was the Gulf Coast Santa Fe roundhouse for Steam engines. Update late 2005!! New public parking North of Hwy 105 REAL CLOSE to tracks added!!! Follow 1st St. North from HWY 105 just after you cross UP tracks going East in dontown Conroe, Tx Follows Conroe siding to CPH 193 (North Switch Conroe siding) If Conroe UP local (LHR35) power is left in Conroe over the weekend it will be 1/2 way North on 1st St., just North of Dallas St. on siding. Map of UP local power location North of Dallas St. on 1st St.
Also possible that power may be at Morrison Supply siding South of interlocker.